You wait for Calamity Jane to be staged and 2 productions come along at once. 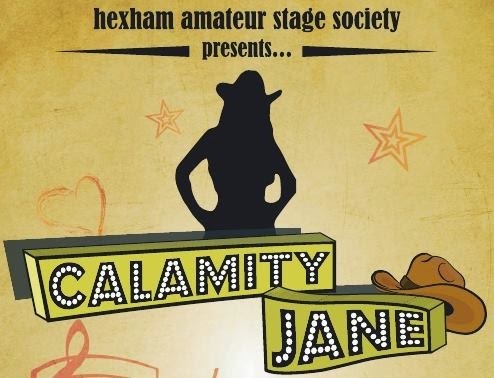 After the Calamity of the professional show earlier in the year it was the turn of the Hexham Amateur Stage Societyto stage the thigh slapping musical. Based upon the 1953 film starring Doris Day and Howard Keel, the musical keeps the sense of place and good humour. Calamity Jane rides into Deadwood, South Dakota, full of stories of her exploits. Her friends accept that she is good at bending the truth in order to create a good tale. When the local bar owner mistakenly books male actor Francis, thinking he was booking entertainment with a female called Frances, she decides to help out. She heads to Chicago in order to persuade big star Adelaide Adams to come back to Deadwood to entertain her fans. Nothing is what it seems and Calamity brings an entertainer back to help out. Early signs were good as a tight eight piece band, under the musical direction of Warren Smith, started up at Queen’s Hall. As the curtain was raised the large ensemble filled the stage and raise the roof with The Deadwood Stage (Whip-Crack-Away!). Kenny Toal, as Bill Hickock, and Clair Applegarth as Calamity Jane are both great singers who come across as very likeable characters. Along with Ruby Westlake as Katie Brown, they are immediately engaging and this helps the audience laugh along with the many humorous lines in the script. Special mention must go to Mike Routledge for his hilarious rendition of Hive Full of Honey. The songs are memorable classics and delivered with zest. Under Elva Mason’s direction, the show whips along at a entertaining pace and it the two and a half hours quickly pass. The show was full of brilliantly coloured dresses and sharp suits, loud bangs and big laughs. It was a delightfully fun show.